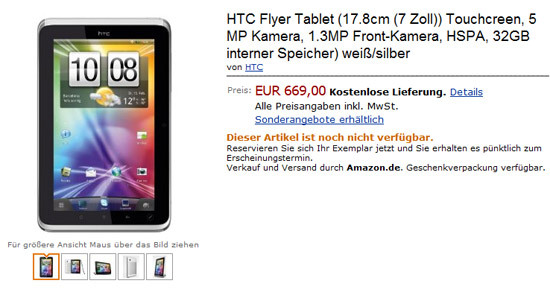 The HTC Flyer is officially set for a Q2 release, April at the earliest at least for Europe and Asia. Still a few months to go, but already up for pre-order at Amazon Germany for 669 €, just a lil over the price that we expected. No Comments on Shipping Date. Expansys UK also annouced it’s taking pre-orders but there’s no mention of price or availibility. Check out the Specs if you missed them in our earlier HTC Flyer post with all the details.